Guides: saw alignment, maintenance, safety 25” / 12” 95 lbs. When you are going from jobsite to jobsite, you need a table saw that is portable and easy to set up when you get to the site. 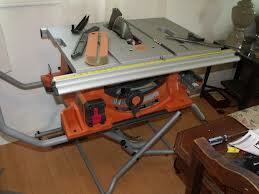 A portable, folding table saw is also important when your workshop has limited space. 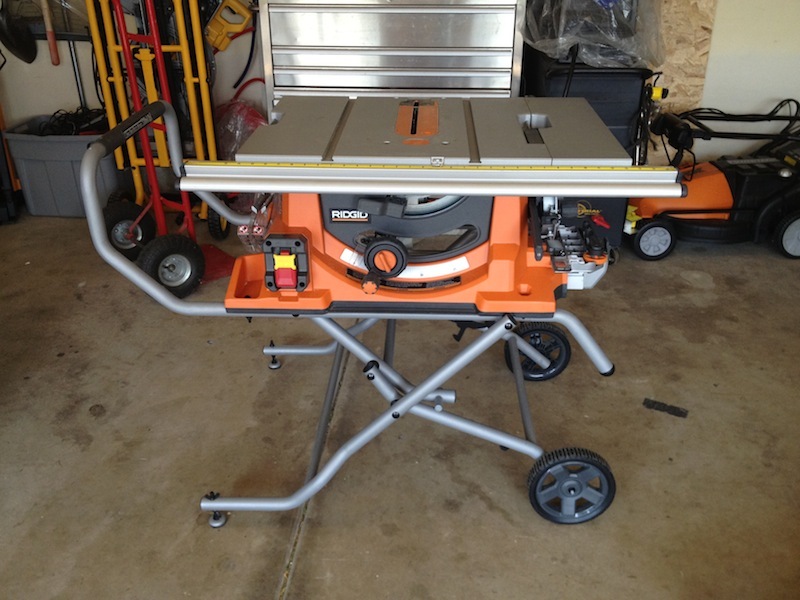 These needs have led to the popularity of table saws with folding, rolling stands, and Ridgid’s R4510 Heavy Duty Portable Table Saw is smack dab in the middle of meeting that need. How well does the Ridgid R4510 hold up to the needs of the contractor or DIYer? Read on to find out! Once you’ve unpacked all of the components and made sure nothing is missing, it’s time for assembly. How Hard is the Ridgid R4510 To Assemble? This might just be one of the easiest saws I’ve ever assembled. Once unboxed, it took me about 10 minutes to read through the operator’s manual, and then another 5 minutes to attach the the rip fence, miter gauage, blade guard, and anti-kickback pawls. Maybe another 2 minutes to attach the saw to the rolling stand. All that means a grand total of about 20 minutes or less from unboxing to cutting and fine-tuning. Tuning this table saw is roughly the same as most other table saw, and the adjustment/calibration settings are easy to access and change. The saw was pretty close to true out of the box, so I didn’t have to do much work to get it up and running properly. What Are the Best Features of the R4510? The rolling stand is probably the easiest to set up and take down that I’ve ever seen, with the gravity-rise feature working almost perfectly every time. The only problem with the rolling stand is a common problem on many rolling stands: the tires are just too small to safely traverse finished stairs without damaging the stairs. If you’re taking this saw upstairs, I recommend having a two-person carry arranged to get the saw to its work location. The Ridgid R4510 features a strong 15-amp motor, and can power through just about any type of wood you throw at it. The 3.5” cutting depth makes 4x material a breeze to rip or trim, so the saw is definitely useful for just about any cutting work you might have in mind for it. Next, this table saw actually includes a useful miter gauge. The gauge is reliable and accurate, and works well straight out of the box. This was a pleasant surprise, since most table saws include miter gauges that I immediately replace with third-party miter gauges rather than trying to fiddle with the included gauge to make it accurate. How Durable is the Ridgid R4510? 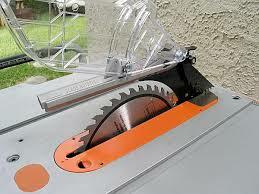 The saw itself is fairly durable, being made of sturdy cast aluminum and stainless steel. However, the motor and stand are not at all durable or rugged; a retention spring fell off the stand early in my usage of this particular saw and Ridgid could not locate the proper parts to repair it for months. Without that part, the saw was essentially useless, because the stand would fold up without any indication that it was about to happen, making for a very unsafe work tool. I also learned, through that experience, that the table saw stand is only covered by a 3-year warranty instead of the lifetime warranty. In addition to the problems with the stand, the motor is prone to failure. This saw, to be honest, has spent more time in the shop for repairs than it has on the jobsite. Motor repairs typically take 2 months or longer, supposedly because of a lack of parts. Is the R4510 Easy to Use? 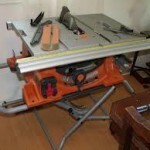 When the saw is working properly and isn’t in the shop for repairs, it is very easy to use. The soft start motor works well, and the oversized button makes for an easy on/off experience. The motor cuts through the hardest woods with ease, even 4x material. The gravity-rise stand is easy to set up and take down, making transportation and setup a snap (other than dealing with stairs, of course). What’s the Warranty Like for the Ridgid R4510? The Ridgid R4510 is covered by a lifetime warranty for the saw itself, and a 3-year warranty for the stand. This is a good thing, because the motor has gone out twice since I acquired this table saw, and has needed repair each time. Unfortunately, warranty service and customer service are where Ridgid really shows up poorly. Repair work takes months to complete, and Ridgid’s customer service personnel are very unhelpful in letting you know when you will have your saw back. This is an annoyance for a casual DIYer, and an absolute dealbreaker for someone who needs their table saw on a regular basis. For this reason along, I would have to say this saw ranks as about a 2 out of 5 stars, according to my judgment of the saw. 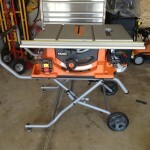 The Ridgid R4510 could be an excellent table saw, if it were not for some unfortunate manufacturing shortfalls. The motor is highly prone to failure, and the table stand is poorly designed. I would not recommend this particular table saw to anybody who needs their saw when they need it, without worrying about downtime or hauling or shipping the saw in for repairs. 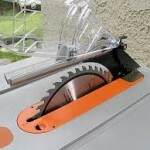 Take a look at Amazon.com’s price on the Ridgid R4510 Table Saw if you’re interested. I’ve had my 4510 since 2005 or 2006. Can’t nail down the exact time. Other than a couple minor things, the saw has performed perfectly. In fact. I had two of them.